This crew is working near Hackett Hill Rd. in Hooksett on May 5 to make extensive repairs to equipment damaged when a massive tree fell onto a power line during a powerful wind storm. CONCORD — The state Supreme Court Tuesday determined state utility regulators erred in rejecting Eversource’s proposed 20-year agreement to reserve natural gas capacity on a proposed pipeline. 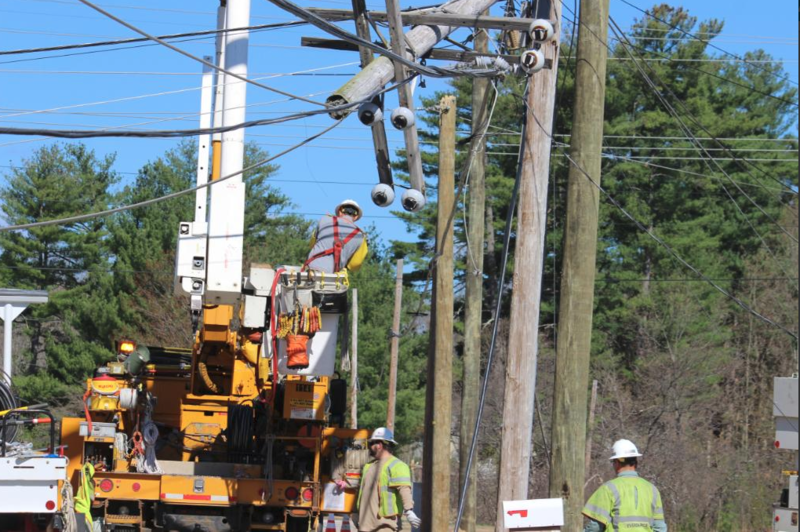 The Public Utilities Commission ruled in October 2016 the proposed agreement with Algonquin Gas for the Access Northeast project violated the state’s electric industry restructuring law. In the 2016 ruling, the PUC said the fundamental principle of restructuring is to reduce electric rates by developing a competitive electric market which is achieved by separating generating costs from distribution and transmission costs. At the time lawmakers said the law would remove the risk of developing and maintaining generation facilities from ratepayers and instead put the risk on the developers and their stockholders. But the Supreme Court said the PUC “misconstrued” the restructuring statues and failed to consider other principles contained in the law. While the ruling pertained only to the PUC’s decision to reject the agreement with Algonquin Gas, Eversource and supporters of the company’s Northern Pass project denied by the Site Evaluation Commission earlier this year, say the court’s ruling addresses the same legal issues in both cases. Brian Murphy, IBEW Local 104 Business Manager, said the decision has direct ties to the Northern Pass project and should prompt the SEC to reconsider its decision. The SEC meets Thursday to deliberate on Eversource’s motion to reconsider the decision. Given this flawed legal analysis and its effects on the state’s economy and jobs, Martin Honigberg should resign as chairman of the PUC and the SEC, Murphy said. “His failure to understand the legal foundation of the state’s key energy law raises serious questions about his ability to lead these key state agencies,” Murphy said. Eversource spokesman Martin Murray said his company believes the Supreme Court interpreted the restructuring law correctly. He said the decision has broad implications for the state’s energy future and the critical need for additional sources of reliable and affordable energy. And he said in light of Tuesday’s decision, Eversource will revisit the PUC’s denial of the purchased power agreement with Hydro-Quebec. “The PUC’s denial, which led to removal of the agreement and its associated benefits from the New Hampshire siting application, was based on the same flawed legal analysis that the Supreme Court today overturned,” Murray said. The majority of the Supreme Court justices said while it gave deference to the PUC in determining its opinion, it also turned to the plain language of the law in deciding there are other fundamental restructuring principles beyond the separation of generation functions and distribution and transmission functions. He says other principles such as a reliable electric system, environmental improvement, renewable energy resources, energy efficiency and near term rate relief also need to be given equal weight. “We disagree with the PUC’s ruling that RSA 374-F:3, III directs the ‘functional separation’ of generation services from transmission and distribution services and elevates that single policy principle over the others identified in the statute,” Lynn wrote.